Loseley Park, home of the eponymous icecream, has been lived in by the More-Molyneux family for over 500 years. The house, set in 400 acres in Surrey, was built in the 1560s. 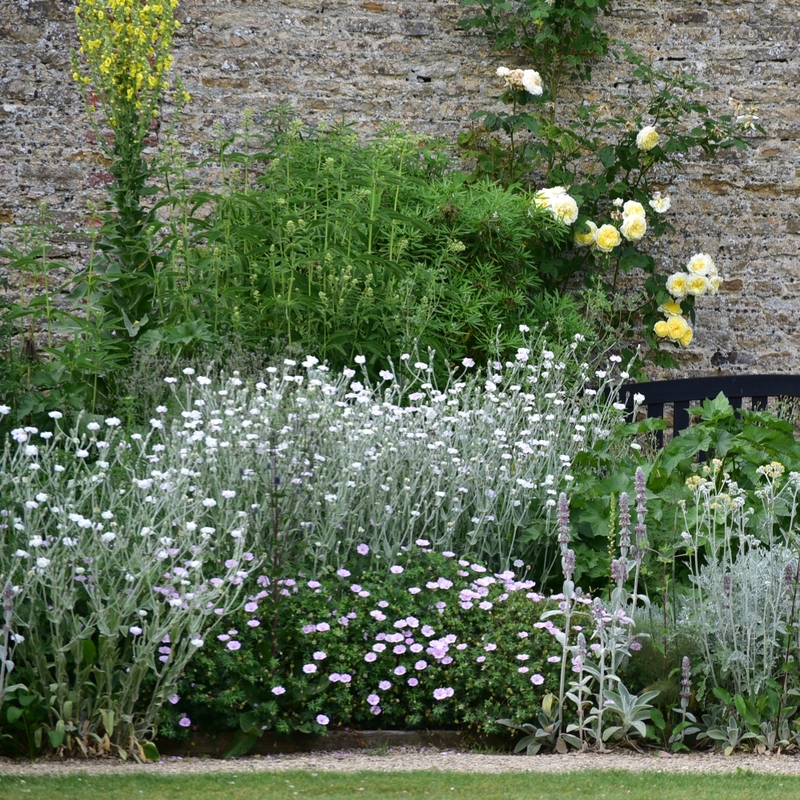 Its walled garden was set out in the 16th century, re-designed by Gertrude Jeckyll in the 19th century and was redesigned again in 1991. Of course there's a rose garden, with over 1,000 roses, and a vegetable and cut flower garden. But in high summer it's the various flower gardens that really grab your attention. The Flower Garden is designed with hot colours in mind, but these only develop in late summer. Now there is a tasteful palette of blue and yellow. 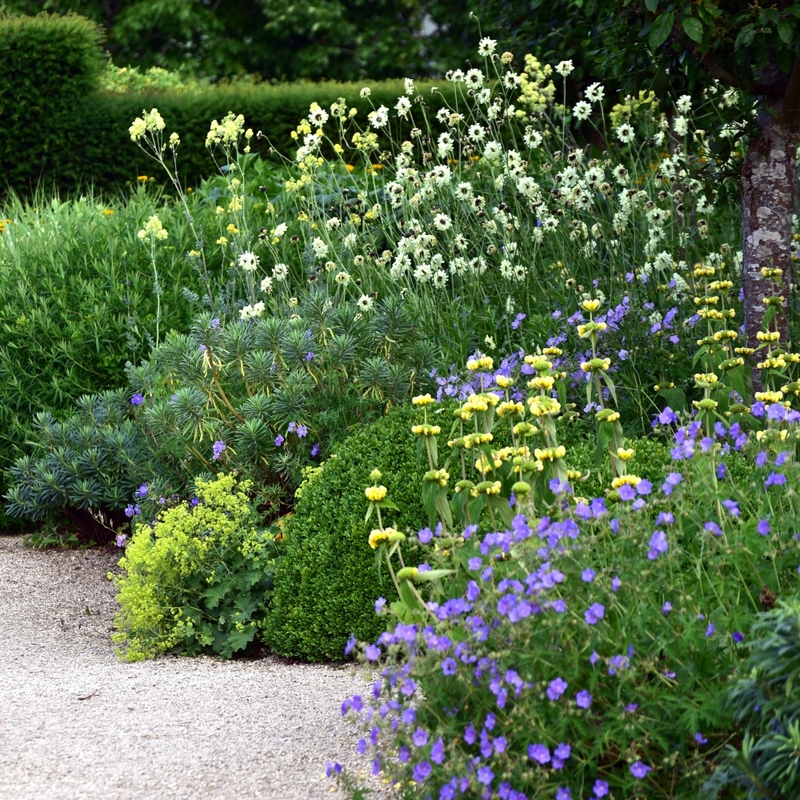 I like the way the plants are packed in, those with looser structures like Geranium pratense and Cephalaria gigantea scramble through evergreen Buxus and Euphorbia, with the frothy Alchemilla mollis skirting the floor. Sissinghurst is not the only white garden in the country. The one at Loseley Park is based around a tranquil pond. It's no surprise this is a popular place for weddings. One of the things you notice about the White Garden is that not all the plants are white. There are creams, silver, pale yellows, pale pink, dark greens and plenty of variegated leaves. One of the more unusual features at Loseley Park is the moat. It's not clear what function it has served but it's now planted with water lillies and Gunnera and home to at least one mallard family with no less than seven ducklings. From the moat there's a short walk through the Rose Garden. At the end of June most of the roses are in full bloom. There was a sculpture display there when I visited. The overall impression was marred somewhat by the sorry-looking box hedge. I couldn't tell what was causing the problem but they have my sympathies, it's getting harder and harder to keep box looking good. The Tennis Court Border would have been easy to miss as it's a bit out of the way. Again there's a blue and yellow theme here, with the full range of Verbascums, from the statuesque V. bombyceferum to the more delicate V. chaixii. It can't all be in good taste though as these poppies were unlikely to have been blue or yellow. The stone walls make an attractive backdrop. I was surprised there weren't more climbers in the garden. There is a magnificent and ancient Wisteria but it was obviously not in flower now. There are a couple of roses but really there is the potential for so much more. There are tea rooms aplenty here but unlike these two I didn't have time even to taste the icecream let alone sit down. You need to plan your visit. There is a tedious diversion in place to get there until the end of July 2018, and the house and gardens are not open on Fridays or Saturdays.